Hello and happy day to you. I hope that the weather is just as spectacular in your neck of the woods as it is for me. I thought I would take a break from being outside to share a recipe with you that I tried for the first time two weeks ago. It was MIL’s birthday and to celebrate, I thought I would try making one of her favorite desserts, lemon meringue pie. I was a bit hesitant at first because I had heard that these pies can be tricky to make, so I decided to hedge my bets by also making a chocolate cream pie. That way, if the meringue didn’t work out, I could pretend that it never happened and still have a tasty dessert to share. I started by baking the pie crust – all was well at that point. Next came the ingredients for the lemon filling. I poured the agave, cornstarch, water and egg yolks into the saucepan and stirred continuously while heating. At first, the ingredients swirled in the pan like an odd assortment of messy debris. I looked away for a moment to mention something to SensitiveHusband, and when I turned back I saw a smooth, glistening, even-colored vision of dessert. It was a fine hour for chemistry in our kitchen! The last piece to make was the meringue topping. Into my stand mixer went the egg whites and agave. I set the mixer to high and watched the mixture slosh around for a bit. After a short time, the liquid turned into a fluffy, voluminous meringue. I stood there, amazed for a moment, and then turned off the mixer. Another score for chemistry in our kitchen! This pie is actually fun to make, especially cool if you ever enjoyed science class, and everyone who sampled it that evening really enjoyed it. Of course, we all had to also try the chocolate cream pie since no dessert should go to waste. It’s a very summery treat for the season. This recipe calls for only three eggs, which is a good thing since the price for wholesale chicken eggs increased 84.5% from May to June. This increase was the largest single-month jump since 1937, when the first records were started. Why the price increase? It’s because the Avian flu killed 49 million chickens during the past winter, according to CNN, thereby reducing the supply. This recipe is adapted from Gluten Free & More‘s April/May 2015 issue, to remove all of the refined sugar. *If you are looking for a ready-made crust without refined sugar, Pillsbury has a refrigerated version. 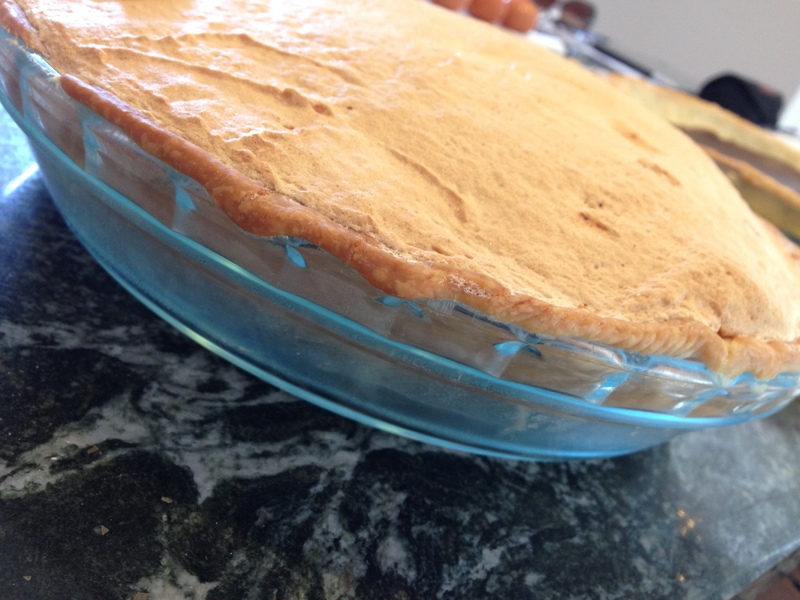 For a refined sugar free homemade crust, try my graham cracker version. If you are looking for a gluten free pie crust, there are many store-made products and homemade recipes available. In a medium saucepan, combine 1/2 cup agave and cornstarch. Stir in water until smooth. Stir in egg yolks. Stirring constantly, bring mixture to a boil over medium heat and boil one minute. Remove from heat. See the chemistry! Stir in lemon zest, lemon juice and butter. Spoon hot filling into baked pie crust. In a small bowl with a hand mixer or in a stand mixer, at high speed, beat egg whites until foamy. Add remaining 1/4 cup agave and continue beating until stiff peaks form. Chemistry again! Spread meringue evenly over hot filling, sealing to the edges of the crust. Bake pie 15-20 minutes or until golden. After cooled, refrigerate until served. Now I’ll talk about the lovely cake featured in the photo. 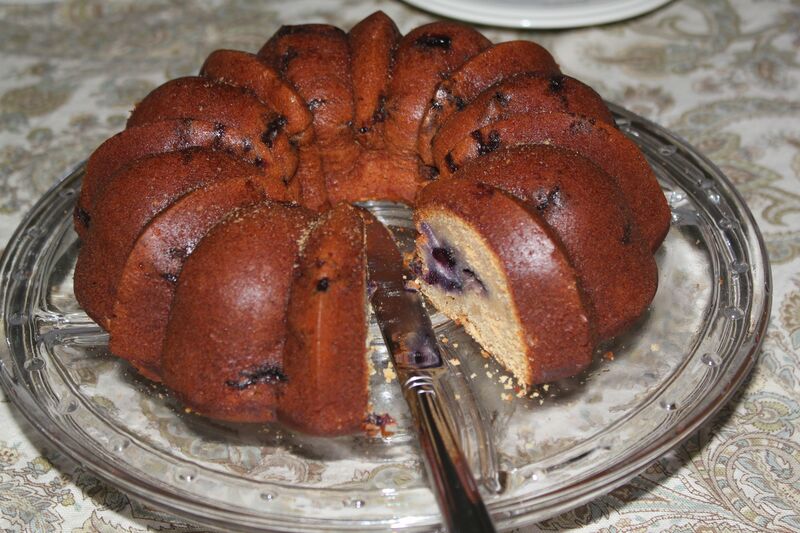 It’s a blueberry-lemon bundt cake! I was inspired by a Martha Stewart recipe, and knew that FIL* would like the lemony, pound cake-like creation. Since we were going to MIL^ and FIL’s house for dinner, I decided to treat them with this dessert. I substituted the sugar with agave nectar – I thought the neutral taste of the agave would work well with the light lemon and blueberry flavors. The original recipe called for two sticks of butter, so I lightened up the recipe by using one stick of butter and 1/4 cup unsweetened applesauce. And instead of 1 cup of sour cream (not my favorite), I used what was in my fridge – 1 cup of plain yogurt (much better). The dusting of confectioners’ sugar as a finishing touch can be simulated with coconut palm sugar in order to have no refined sugars in this recipe. The cake was a hit – everyone around the table enjoyed the dessert, including FIL and my littlest nephew! They shared two pieces, although I think my nephew may have eaten all the blueberry-filled pieces that my FIL had! This is a great dessert that could also be eaten for breakfast since it’s not too sweet, and it would go nicely at a summer picnic. Enjoy! In a mixing bowl, cream butter and agave nectar on high speed until light and fluffy. Add eggs, one at a time, beating until incorporated. Beat in vanilla extract. Add flour mixture in three additions, alternating with two additions of yogurt. Mix until fully incorporated. In a bowl, toss blueberries and zest with remaining teaspoon flour; gently fold into batter. Coat a 12-cup nonstick Bundt pan (or two loaf pans) with cooking spray or a light coat of butter. Spread batter in prepared pan(s). Bake cake on bottom rack of oven until a toothpick inserted into center of cake comes out clean, 60 to 70 minutes. Cool in pan 20 minutes. Invert onto a rack; cool completely, top side up. Dust with coconut palm sugar before serving, if desired (sure!). I am sharing this recipe with Simply Sugar and Gluten Free, Miz Helen’s Country Cottage, Something Swanky and Food Trip Friday. Good Memorial Day to you! I hope that you have been enjoying a wonderful holiday weekend. In a break from a regular story-telling tradition I will start with the happy ending of the story. I created this cake for the guests at a picnic, which also marked the celebration of my mother in-law's birthday. There were a lot of oohs and aahs when everyone saw the cake, and lots of happy noises as people enjoyed it. 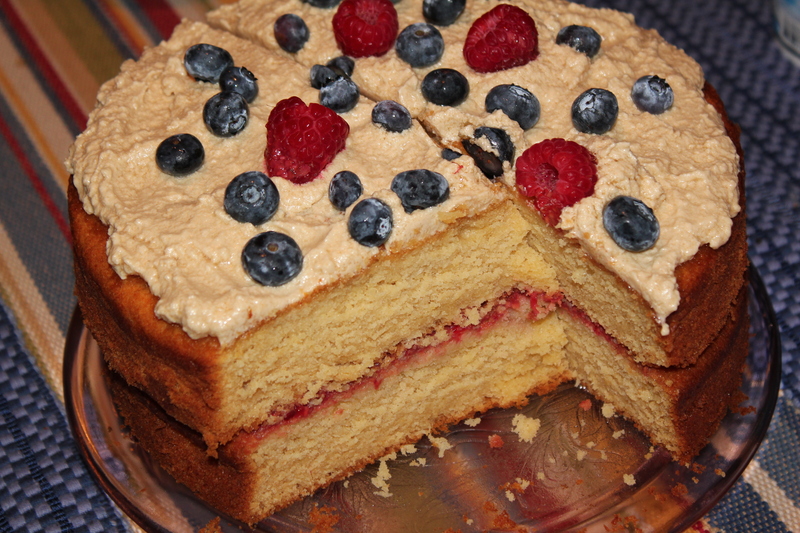 The surprise to everyone was that the cake did not contain one bit of refined sugar. It tasted just as sweet and satisfying as a proper cake should without that pesky cane product. Since I have a food sensitivity to cane sugar, I am motivated to find work-around solutions because I have a large sweet tooth. I have learned, through trial and error, that one can still bake cakes (and cookies and breads) and eat them too! And as an economist by trade, I am a big fan of spreadsheets. I have created a natural sweetener conversion chart in case you want to modify some of your own recipes. My favorite natural sweeteners are agave nectar, honey and maple syrup. Whether you are sensitive or not, try a few substitutions and see what you think about the finished products. And now I’ll end this blog with the start of the story: creating the cake. I found recipes for lemon cake and vanilla buttercream frosting, substituted the sugars with agave nectar and doubled the cake recipe to have two layers. To make the raspberry filling, I mashed one pint of raspberries with one tablespoon of agave nectar and one teaspoon of water. And I halved the frosting recipe to just cover the top of the cake. Serve with agave-sweetened ice cream or raspberry sorbet. Preheat oven to 350 degrees F. Butter, or spray with a nonstick spray, a 9 inch circular pan and dust with flour. In the bowl of your electric mixer (or with a hand mixer) beat the butter and agave until light and fluffy and pale in color. Add the eggs, one at a time, mixing well after each addition. Beat in the vanilla extract and lemon zest. Sift together the flour, baking powder and salt and then add to the batter along with the lemon juice. Mix only until incorporated. Pour the batter into the prepared pan, smoothing the top with an offset spatula. Bake about 40 – 45 minutes, or until a toothpick inserted in the center comes out clean. After all of the ingredients are in a bowl, mix on medium-high for a few minutes until the frosting is stiff and lightened in color. If your frosting needs to be thinned out, add 1 extra tablespoon of milk. Spread the raspberry filling evenly between the two cake layers, and frost the top of the cake with the vanilla frosting. Decorate with your favorite fruit – I chose blueberries and strawberries. I am sharing this recipe with Simply Sugar and Gluten Free and Food Trip Friday. Hi, everyone! This blog brings good news – I am a guest blogger on Something Swanky, a blog about making your own delicious cupcakes and desserts. One of my newer recipes is featured – Lemon Cake with Fresh Raspberry Filling and Vanilla Buttercream Frosting. Please check it out by clicking on the link above and tell us both what you think! Have a great day.